CLEVELAND, Sept. 27, 2013 /PRNewswire/ — Consumers are bombarded with as many as 5,000 messages a day. They are in complete control of how they buy. They can ignore your advertising at will. So how do you get them to pay attention to you? In “Epic Content Marketing: How to Tell a Different Story, Break Through the Clutter & Win More Customers by Marketing Less” (McGraw-Hill), Joe Pulizzi, one the world’s leading experts on content marketing, explains step-by-step how businesses can drive EPIC sales by creating content that is so helpful, so valuable and so compelling that customers can’t live without it. “Joe lays out the objectives, principles and core strategies of content marketing in a way that’s easy to understand, inspiring and entertaining. If your company doesn’t yet realize that it’s a media company, you’re missing the most powerful way to connect with your customers,” says Julie Fleischer, Director of Media and Consumer Engagement, Kraft Foods, and 2013 Content Marketer of the Year. 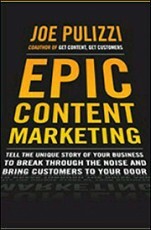 Whether you’re the CMO of a Fortune 500, a digital marketer, or entrepreneur, “Epic Content Marketing” is a groundbreaking guide that provides a framework for developing a powerful content strategy that involves developing and distributing EPIC stories–for websites, blogs, and social media–that leads directly to greater profits and growth. What are you waiting for? Start your EPIC journey now! About Joe Pulizzi: Joe Pulizzi is a content marketing evangelist, speaker and author. He’s the founder of the Content Marketing Institute, which produces the largest in-person content marketing event on the planet, Content Marketing World. He has spoken at more than 200 locations and 10 countries around the world advancing the practice of content marketing. He’s also co-written two other books: “Get Content Get Customers” as well as “Managing Content Marketing.” Find him online at JoePulizzi.com or on Twitter @JoePulizzi. If you ever meet him in person, he’ll be wearing the color orange. The Content Marketing Institute is the leading global content marketing education and training organization. CMI teaches enterprise brands how to attract and retain customers through compelling, multi-channel storytelling. CMI’s Content Marketing World event, the largest content marketing-focused event, is held every September in Cleveland. CMI also produces the quarterly magazine Chief Content Officer, and provides strategic consulting and content marketing research for some of the best-known brands in the world. CMI is a 2012 and 2013 Inc. 500 company.